Unlimited streaming music, for free, legally available all over the world, and with no audio ads. Have I got your attention yet? That’s just what 8tracks offers. One of the oldest and best music websites in existence, we mentioned 8tracks 8Tracks: Create, Share and Listen to Mix Tracks 8Tracks: Create, Share and Listen to Mix Tracks Read More way back in 2008, and far more recently as one of several great tools for creating digital mixtapes Let The Good Times Roll: Great Tools For Creating Digital Mixtapes Tested Let The Good Times Roll: Great Tools For Creating Digital Mixtapes Tested It may have been a while since you made a mixtape for someone. It's understandable, as mixtapes are more closely associated with the '80s and '90s than the '00s and beyond. Having already explained how... Read More . Most recently, I’ve shown you how to enjoy 8track on the go Enjoy Free, Unlimited Streaming Music On The Go With InfiniTracks for Android Enjoy Free, Unlimited Streaming Music On The Go With InfiniTracks for Android While 8Tracks remains just as wonderful as ever on the Web, you may want to listen to it when you're on the go, which is where InfiniTracks comes in. Read More with the amazing third-party client InifiTracks. 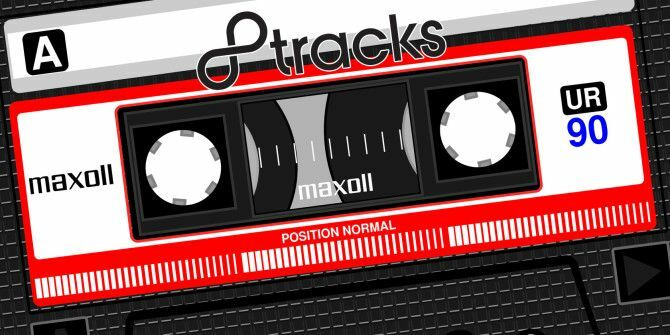 But interestingly enough, we’ve never taken an in-depth look at the 8tracks website itself and all that it offers. That is about to change. Before we dive into the screenshots, let me give you a bird’s eye view of how 8tracks work: People create mixtapes by uploading music from their computer, or by linking to Soundcloud (a service Tim covered back in 2011 Music Lovers: Why Aren't You Using SoundCloud? Music Lovers: Why Aren't You Using SoundCloud? Discovering a new artist, album or record label that corresponds with your tastes and expectations can be a rewarding experience. These golden discoveries can be few and far between and that’s where I turn to... Read More ). You can decide which tracks to put in your mix, but you don’t really have full control over the sequence in which they’ll be played (due to legal issues). Also, in years of using 8tracks, I’ve yet to see a single complete album by one creator on the service – it’s just not how it’s meant to be used. The result is an eclectic mix of excellent tracks, usually conveying one feeling or style. So don’t go to 8tracks looking for albums you love – go in search of a musical “feel” or groove, instead. Here you can see the mix you’re currently playing (Haunting acoustic covers, in my case), as well as a feed showing what the people you’re following have been up to. For each mix, you can see how many times it was played and Liked (that’s internal Likes on 8tracks – no Facebook involved), its total playtime and track count, as well as tags, a description, and an often lovely cover image. Basically, everything you could possibly want to know about the mix before you even start playing the first track. Actually, speaking of tracks, you don’t get to see the exact music featured in the mix, which could explain why you so much other information is made available. You can see Like the mix, add it to a collection, or share it. You can also Facebook-Like it, as well as +1 on Google Plus. Finally, as each new track plays, its name scrolls onto the mix page. So you don’t know what you’re going to listen to in advance, but once the song comes on, you can Star it and get back to that specific track at any later time. In other words, you don’t have to play the mix and sit there, waiting for that song you love to come up. It’s “persistent” in that it doesn’t go away when you navigate around the website. So you can cruise around, look for different mixes, and leave comments, all without interrupting the music. What’s more, if you’re curious about the artist you’re listening to, you can click the Info icon and get a photo along with a detailed bio. Note the selection of playback buttons: You can pause a track or skip to the next one, but you can’t go back. The direct button to any available YouTube video (which pops up alongside) is a nice touch. You can see how many mixes the users created (and listen to them), how many followers they have, and how many people they’re following. There’s also a little blurb about the user, which tends to be quite uninformative (though I do agree with that bit about music giving wings to the mind). That’s one thing I started the post with, and it’s important enough to end with as well. Being based outside the US, I am all too accustomed to finding myself blocked from listening to many cool music services. With 8tracks, that’s just not the case – you can listen to it pretty much anywhere (let me know in the comments if you find that’s not true, as well as where you’re from). It also bears repeating that there are no annoying audio ads here – you just pick a mix, and enjoy listening to it. A truly remarkable service that has been around for years, and deserves more love. Go check it out today, and feel free to recommend any great mixes you find in the comments! I have been using this for some time now on both android and windows platforms (in winphone8 it's called mixtapes, personally I like the layout on w8 phone a little better). It's probably one of the better streaming services out there.